The Stovesonline Moisture meter is a simple to use, no nonsense, device that will help you check that the wood you are burning on your stove is dry enough to avoid the build up of tar in the chimney and give you maximum stove efficiency. 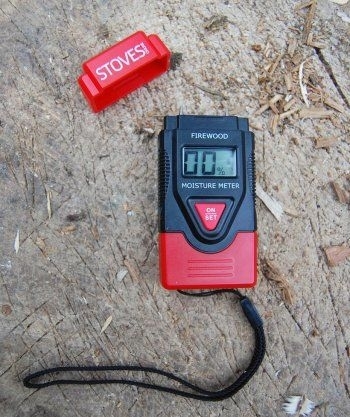 The meter is also useful for checking on how your wood is seasoning. Our moisture meter has a range of 0-40%, seasoned wood should have a moisture content of less than 20%. The Stovesonline Moisture Meter has a back light, auto power on-off button and low battery indicator. The batteries used are LR44 type which are readily available.